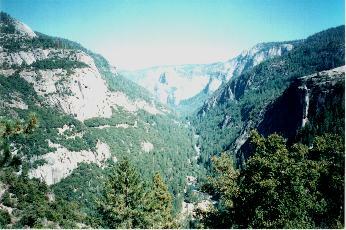 yosemite, august 1995 - Western USA has a lot of beautiful National Parks (NP) and National Monuments (NM). Yosemite in the state of California is only one of them, but probably the best known and most inspiring to a lot of people worldwide. This NP has a lot to offer to its visitors that come here to camp, to hike or to do some rock climbing. I camped here for a couple of days and did a lot of hiking surrounded by amazing landscapes and granite rocks, in the footsteps of the famous people like John Muir. Native Americans were here about 4000 years ago already, and considered the place as 'magical'. The natives have gone now, but the magic remains. Early in the morning, I started at the visitor centre (alt. 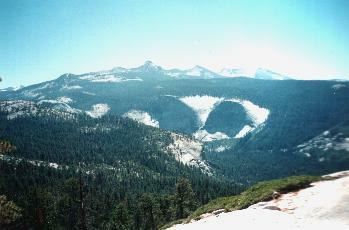 about 1200 m) for a hike to 'Half Dome' (alt. 2695 m). A lot of rocks and lakes have special names in the valley, this one got his because it resembles a dome split in half, although scientists think it never really was a 'full dome' rock. This hike took me about 10 hours round-trip. The brochure in the visitor centre states 'a tiring hike with unsurpassed views...'. It was around 28 degrees C that day, so better take enough water too. 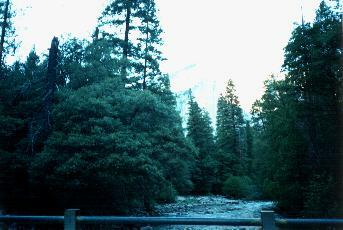 The first leg of this hike took us along the Merced river and into the giant pine tree forests. In this rocky landscape, a river means... waterfalls ! Indeed, not long after we started we took the 'mist trail', a staircase type of trail up to the Vernal Falls (1538 m - around 100 m drop !). This trail is always slippery and you can feel the waterfall as you approach it, when the wind blows in the right direction. Passed this falls, the trail goes on towards yet another one, 'Nevada falls' (1801 m). A little bridge crossing the river on top of the waterfall permits you to have some spectacular views. But we were only halfway. From here on, the Half Dome trail took a big detour around the rock giants like 'Liberty Cap' (2157 m). All along the way we could see some high peaks, but of course we were focussed on our end point 'Half Dome', which was visible from different directions. The trail now took us into dense pine tree forests, and was slowly ascending. When we came out of the forests, a rocky path lay before us, now the ascent was faster, and when we looked behind, fantastic views of the Sierra Nevada were visible. Finally we reached the base of 'Half Dome'. From here on , the real work began ! To get to the top, you have to do the 'steel cables'. The slope is about 60 degrees, clearly to much to be able to walk on. For this purpose, poles are dug into the rock, and a pair of steel cables connect all of them and allow you to walk onto the rock by holding the steel cables (don't forget to put gloves on !). From time to time wooden planks allow you to rest a little. And to be honest, it is tiring ! When you are up the rock, the wind blows into your face and when you look to your left or right, all you can see is granite. It took me quite some time to get to the top (from my memory I guess about 30 minutes), but the reward for this 'suffering' was high : the view on the top is just superb and the 'on-the-top-feeling' just heavenly. There is not a lot of space on the top, but even up here the squirrels get to steal some of your cookies or sandwiches. We drank lots of water because we were almost dehydrated from the steel cable climb. But our adventure was not over yet. As we went down (again the steel cables), we were stopped about halfway. Someone had fallen and lay unconscious between the cables. Rescue people were already helping him. Nobody could go up or down as the 'path' between the cables was now blocked. We stopped and sat down on one of the wooden planks but I can assure you that's not easy and - to me at least - a little frightening experience. But we had another problem. We had to be back in time to meet our bus back in the valley. So we had to find a way to get off this rock. After some talking to the rescue team, they allowed us to pass by the fallen man, on the outside of the cables, only holding one cable, and going very slowly. This is the part of this hike I would not like to do again, because it felt quite dangerous. 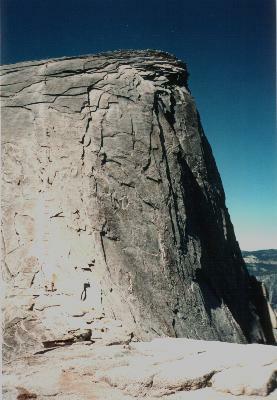 By the time we got down, a helicopter landed near the base of 'Half Dome'. There was now a big crowd over there waiting till the way was clear to go up the rock again. I never heard again about the unfortunate man, but I hope he survived his adventure. Now we were a little late to get back, and decided to go a little faster, after all it was all the way down. The last two hours, we had run out of water (all of the three litres had gone). Imagine our happiness when we saw a fountain with drinking water after an hour or more of thirsty hiking. This was probably the best drinking water ever. We arrived in time at the bus and went for pizza in the visitor centre. We were hungry and tired, but we made it ! And that was such a good feeling.